Money management. For some of us, this is torture. So many Financial Managers require you to categorize everything into specific areas for instance: 1) Bills 2) Mortgage 3) Food 4) Entertainment 5) Other necessities 6) Savings. But really, who’s to say that going out to celebrate your birthday wouldn’t qualify as a food expense rather than entertainment? With all those very specific categories the whole process can be very daunting, downright frustrating and in the end why does it matter? All you want to know is if you can afford to buy the new iPhone. 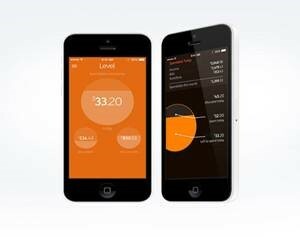 Level, an app made to simplify managing your money with one, two, three:1) What you make.2) What you need to set aside for bills.3) What you save. Forget the rest of the buckets, with these 3 you’ll know everything you need to know about exactly what you can spend today, this week and this month. You’ll easily be able to make better spending decisions today and save for the future tomorrow. Set up is easy and secure. Through its partnership with Intuit, Level is designed with bank-level security and encryption and high privacy standards. To set up your Level account, create your profile, link your bank accounts, select the accounts you want to use and watch as Level calculates your current spending and desired saving amounts. When you log into Level, the dashboard will show you exactly what you can spend today, this week and this month. Click on a circle to get more information or view all of your activity in the activity view. See real time updates on all of your spending at any time and adjust what you want to save or your income whenever you need to.